Consider an object is moving with a uniform acceleration “a” along a straight line. The initial and final velocities of the object at time t = 0 and t = t are u and v respectively. During time t, let s be the total distance travelled by the object. In uniformly acceleration motion the velocity – time graph of an object is a straight line, inclined to the time axis. OD = u, OC = v and OE = DA = t.
Let, the object reaches at point B after time t, and its final velocity becomes, v.
Draw a line parallel to x-axis DA from point, D from where object starts moving. Draw another line BA from point B parallel to Y-axis which meets at E at y-axis. Second Equation of Motion: Distance covered by the object in the given time “t” is given by the area of the trapezium ABDOE. The area of trapezium, ABDOE. 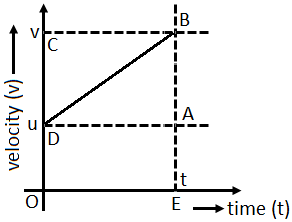 Distance (s) = Area of ΔABD + Area of ADOE. s = ut + ½ at². It is the expression gives the distance covered by the object moving with uniform acceleration.